After weeks of speculation about his whereabouts, missing paramilitary police commander Gulmurod Halimov has shown up inside the so-called Islamic State. In a YouTube video released on May 27, the US-trained officer explains that he joined IS to protest increasing restrictions on religious freedom at home in Tajikistan. 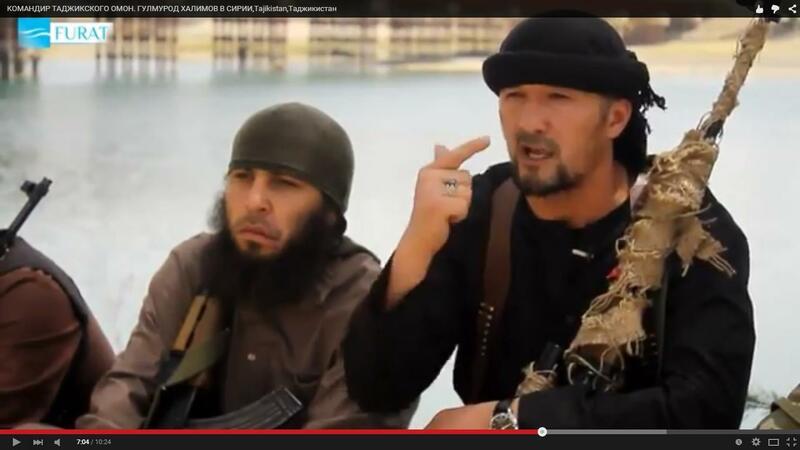 The high-definition release is glossier than the usual Tajik extremist videos. IS, it appears, has wasted no time capitalizing on the propaganda potential of their most high-profile Tajik recruit to date. In the ten-minute clip, Colonel Halimov – who spends most of his time speaking in Russian, suggesting he seeks a wide post-Soviet audience – discusses his 19-year career with Tajikistan’s paramilitary police unit (OMON). He talks about going to the United States in 2003 and 2007 to train with the U.S. Army and defense contractor Blackwater. “I came to America three times. I saw how you train people to kill Muslims. I will come with this gun to your home and kill you,” he declares. He talks about studying Islam at school and how he started praying in 2001. His country’s repressive religious policy, he says, made him decide to join the Islamic State’s jihad. All Tajiks, including those in Russia, should join IS, Halimov declares, and fight the regime of Emomali Rahmon. Taking aim at his former colleagues in Tajikistan’s secular security forces, he claims that Interior Minister Ramazon Rahimzoda ordered a hijab ban in Dushanbe and that the Interior Ministry paid prostitutes 10 dollars each to appear in hijabs in a recent video that state media used to discredit Islam. The famed marksman brandishes his sniper rifle throughout. At the end of the clip he blasts a tomato. Halimov’s colleagues have been quick to condemn the video, which cannot be independently confirmed as authentic (and which appears to have been taken down by YouTube several hours after appearing online). Speaking to RFE/RL’s Tajik service, Radio Ozodi, one former colleague expressed disbelief, saying Halimov must have been lured into joining by large sums of money. His brother was also doubtful, saying that the man in the video looked like Halimov, but claimed that his beard looked strange. An Interior Ministry spokesman told Radio Ozodi that he had seen the video, but refused to comment. Clearly authorities in Tajikistan are concerned. Local media report that the state Communication Service immediately ordered Internet providers to block a string of websites including YouTube, Radio Ozodi and several Russian social networks. The head of the Association of Internet Providers of Tajikistan, Asomiddin Atoyev, called the move an attempt to stop people sharing Halimov’s video. Handpicked by Rahmon to lead OMON in 2012, Halimov fought against insurgents in the Rasht Valley and Khorog in 2012. His famed skills will now be put to use in Syria.